No3 thinner for use with FLAG Antifoulings and FLAG Marine Primers. Use for cleaning brushes and equipment also. Not suitable for FLAG Performance PTFE, CopperQuick or FLAG Racing Glide. 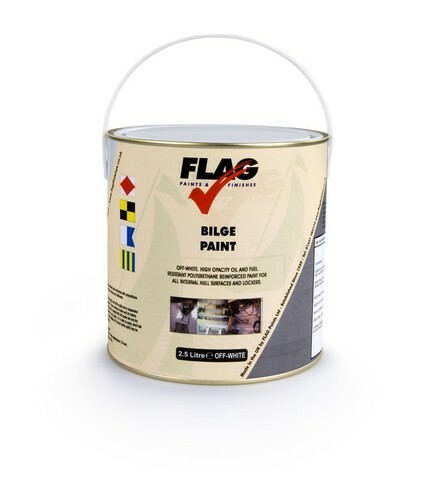 Manufactured in the UK by FLAG Paints Ltd.
One coat paint for all internal surfaces, ideal for bilge areas, giving good resistance to oil, grease, salt water and fresh water. (picture for illustration purposes only). Theoretical spreading rate 10 -12 sq.metres per litre. Manufactured in the UK by FLAG Paints Ltd.
Copper based antifouling free from booster biocides. This is an economical (cruising grade) self eroding antifouling with proven performance within a wide variety of UK conditions and many European locations. Proven to create less 'build up' than many traditional antifoulings. Theoretical spreading rate 10 sq. metres per litre. Manufactured in the UK by FLAG Paints Ltd.
Universal grey metallic primer suitable for above and below the waterline on all substrates with good waterproofing and corrosion resisting performance. Also suitable as a primer or barrier coat under FLAG and other traditional antifoulings. Theoretical spreading rate: 12sq.metres per litre. Manufactured in the UK by FLAG Paints Ltd.
Copper based antifouling. FLAG Performance Extra Antifouling is semi-hard to enable use in most craft up to 40 knots but still able to refresh its surface with some mild erosion. Proven performance for all types fouling in all waters. Theoretical spreading rate: 10 sq.metres per litre. Manufactured in the UK by FLAG Paints Ltd. Uses the metallic copper binding with PTFE based resin to also reduce hull friction and the chance of marine organisms getting a hold. Being a ‘hard’ antifouling it can also be burnished for a racing finish. The paint comes premixed (although it requires thorough stirring before and during use), can be applied over most other ‘hard’ antifoulings and is extremely cost effective. It is therefore suitable for racing, cruising, sail, power, high speed, drying moorings, trailer boats, sea and fresh water. (Currently only available as a made to order bulk item). Specially formulated wax for finishing and enhancing. Suitable for polishing boat hulls/topside areas. Easy to apply, giving a natural polished look. A high quality traditional recipe. Manufactured in the UK by FLAG Paints Ltd. Gloss varnish, based on premium quality resins. Provides a tough and flexible finish. Suitable for marine applications, also doors, window frames, furniture and floors. Coverage: 16 sq. m. per litre. Manufactured in the UK by FLAG Paints Ltd.